I always anticipate summer to be an opportunity for rest and relaxation, and every year, summer whizzes by with a full schedule of appointments and family visits and school readiness with little rest and even less relaxation. Though we do take time here and there as a family to capture little pockets, the concept of taking time to sit back and revive one’s energy remains just that, an idea. Some of the reason is simply the season of life we are in at the moment. The years raising children tend to be rather hectic and chaotic. Another reason is that working in the public school system during the year means having to work during the summer to supplement the income which precludes “vacation time”. Yet a third is that we live in a world that is busy, and we get caught up in that busyness. As I was pondering busyness this week, I realized that as a family we are beginning a time where a “reset” is quite possible. Two of our three children will be away at graduate and undergraduate schools. I have stepped down from most of the obligations I have spent 17 years pursuing. My husband and I are looking at new life ventures. If ever we could make choices about health and lifestyle and time spent, it is now. Deciding to make the choices, though, tends to be easier than following through with action. A recent email illustrated this. Someone’s health issues meant she had to really begin to watch what she ate. Her grandmother, however, had passed down a chocolate chip cake recipe which she loved and made frequently for the family. Lately, though, as her health has had more complications, she finally realized she couldn’t continue to eat her grandmother’s cake as it was originally made. She needed to remove the gluten and dairy which were making her sick and to make it healthier, fat-wise. She reached out to me to see I might be able to revamp the recipe. The original recipe called for 1 1/2 cups of butter, 2 1/2 cups of sugar, 4 whole extra large eggs, 1 tsp vanilla, 4 cups all purpose white flour, 4 tsp baking powder, 1 tsp baking soda, 2 cups full fat sour cream, and 2 1/2 cups chocolate chips. You can see why she shouldn’t be eating it on a regular basis! Making the cake gluten free was simply a matter of swapping a gluten free flour blend. 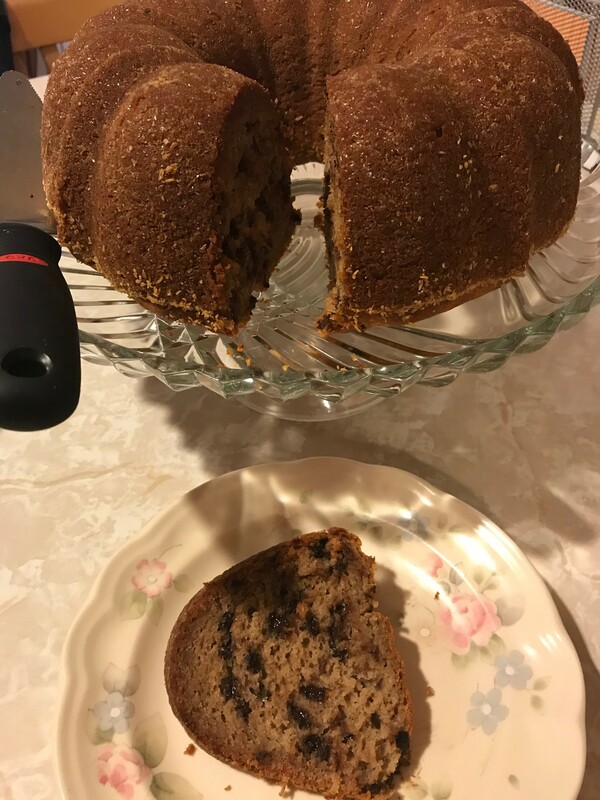 I chose to use King Arthur’s wholegrain blend, but since I wanted to give the cake more protein and fiber, I opted to substitute one cup of the flour with gluten free oat flour which I made by finely processing gluten free whole rolled oats into a flour. This added the overall protein and fiber count of the cake. Since making things healthier for me always includes removing the white refined sugar, I reduced the sweetener down to 1 cup and used agave instead of sugar. The butter, sour cream and eggs, however, required some thinking. I needed to reduce all three if we wanted a healthier cake but how to do that without sacrificing the moisture in the cake? I switched vegan butter for the regular butter and reduced it to 1/2 cup. I substituted tofu sour cream for the regular and used only 3/4 cup. Then I reduced the eggs to two large. All these reductions needed to be replaced, though, and as I thought about it, I finally decided to use banana cream. For folks not familiar with this, you simply freeze banana slices to the point where they’re mostly frozen but still a little flexible. Then you pop them into your food processor and let it zoop for several minutes until the frozen banana slices become the consistency of soft ice cream, which is how many folks eat it. I used it as a replaced for the missing butter, eggs and sour cream, and it worked beautifully, adding the moisture needed but not tasting overly much like bananas. The final few changes I made were to use mini allergy friendly chocolate chips instead of the regular larger sized ones and to reduce the amount to 1 cup. Since the chips are mini, they distribute more evenly into the batter, and you need a lot less to get the same chocolate chip to cake ratio. I also added a tablespoon of cinnamon to add flavor and to help regulate blood sugar levels. The folks I served it to this week, thought the cake was delicious, and the person who had originally emailed was glad she could eat it without making her health issues worse. *To make banana cream: Slice bananas into three cups worth and put into the freezer. Freeze just long enough to begin to freeze but so they are still slightly flexible. If you put the banana slices until a shallow pan in an even layer, this would only take 15 to 30 minutes. You can also freeze the bananas ahead of time in a tupperware, and when you need it, microwave them for just a few seconds to keep them frozen but pliable. Put the mostly frozen pieces of bananas into a food processor and begin to process until the pieces turn into a creamy soft ice cream mixture. This will take several minutes. Make the mixture just before you are ready to add it to the wet ingredients. **You can use store bought gluten free oat flour, but if you want more protein and fiber, take gluten free wholegrain rolled oats and put them into your food processor and process until you have oat flour. This will take several minutes. In a mixer, cream the vegan butter. Scrape down, and with the mixer on low, slowly pour in the agave and blend the butter and agave until smooth. Add the banana cream and blend just until mixed. Add the vanilla. Add the eggs, one at time, mixing well with each addition. Set the wet mixture aside. Mix the flour blend, oat flour, baking powder, baking soda, and cinnamon. Add half the dry ingredients to the wet and blend. Add the tofu sour cream. Mix well, and then add the second half of the dry ingredients. Add the vinegar and mix just until blended. Pour the batter evenly into the prepared pan and bake for 50 to 55 minutes until the cake has puffed, is golden, and an inserted toothpick comes out clean. Allow the cake to cool in the pan for at least 15 minutes before removing to a wire rack to cool completely.